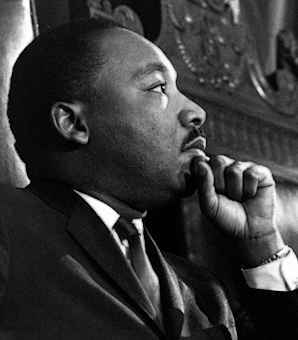 Seventy five years ago today, Martin Luther King Jr. was born. He should be resting in peace but instead he is probably rolling in his grave. Protesters and the Secret Service are apparently squaring off over Dubya Bush's attempt to visit the great protest leader's grave on route to a GOP fundraising event. From what I've been told, there are people in Atlanta who are refusing to obey police and leave the area so that Bush can go lay a wreath at MLK's crypt without having to actually see anyone. Apparently, CNN, based in Atlanta, is unable to get a camera there. Odd - they always have cameras at Bush's appearances.